The Pre-General Election Campaigning is already in full swing. While some opposition political parties have quietly begun their weekly walkabouts to reach out to the community in their targeted wards, the People’s Action Party has begun their onslaught with eye-grabbing headlines on the Straits Times. The 3 October 2009 edition of the Straits Times carried 2 headlines: “Non-PAP wards get upgrade” and “Yaacob fears class divide”. While it is deplorable that HDB has involved itself in the campaigning by informing the PAP grassrooot advisors Sitoh Yih Pin and Eric Low in Opposition wards about HDB upgrades, it seems so strange that the class divide is portrayed as solely a Malay problem. Both Sitoh Yih Pin and Eric Low were the PAP candidates for Potong Pasir and Hougang respectively who lost to the Opposition in General Election 2006. For rejecting the PAP candidates, the constituents of Potong Pasir and Hougang were informed that they would be last in line for the Lift Upgrading Programme (LUP). When HDB upgrading finally arrives at the door step of the Opposition wards, it is portrayed as a PAP’s effort and not PAP’s inertia to provide equitable housing benefits to all citizens. Grace Fu, Minister of State for National Development, had said in a November 2006 Parliamentary Debate that “the electorate in Potong Pasir has obviously not supported that and therefore they should not stand to benefit from any surpluses that are generated from that suite of policies,” in response to Chiam’s call for PAP to stop withholding HDB upgrading in Opposition wards. Moreover, the class divide is not solely a Malay problem. 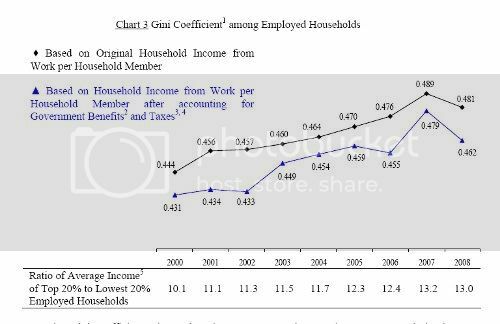 According to the Key Household Income Trends 2008 Report, there is an upward trend of the Gini coefficient, suggesting that the rich-poor gap is increasing in Singapore. The class divide between the rich and the poor is not just affecting Malays but also all Singaporeans. Yet one single fact is not emphasised – the Old Guards are no longer in charge of the People’s Action Party. Given the extent of walkover in the last General Election, it is really hard to ascertain whether the electorate is indeed confident of the current generation of PAP leaders to lead the country. To compound the problem further, uncertainty arising from the post-LKY era also adds a dent to the public confidence in PAP governance. 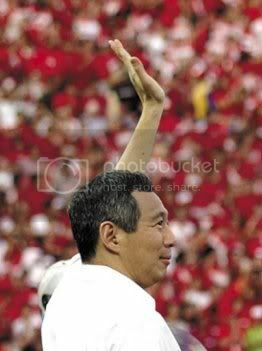 The 2006 PAP Manifesto was titled “Staying together, Moving ahead” and it has 6 themes: (1) Create Opportunities for more Singaporeans; (2) Give our young the best start; (3) Encourage every citizen to play a role; (4) Do more for lower income Singaporeans; (5) Help older Singaporeans to lead full and active lives; and (6) Provide affordable healthcare for all. How much of the 2006 Manifesto has actually been achieved? Does the 2006 Manifesto actually meet the people’s aspiration and needs? To create opportunities for more Singaporeans, the PAP Government has been aggressive in promoting Singapore as a casino hub, an aerospace hub, a non-profit hub, a life science hub and an energy trading hub. At the same time, the PAP Government implemented a lax foreign labour policy. This led to the influx of foreign workers competing against Singaporeans for jobs in Singapore. The global economic crisis has also put a lot of stress on the Singapore’s economic growth model. On giving our young the best start, the public universities in Singapore remain biased towards polytechnic graduates, while our universities openly welcome the enrollment of foreign students. If higher education in Singapore is indeed affordable, why are students and their parents taking out bank loans to pay their school fees? The PAP Government has been reluctant to regulate the private education sector, until some private schools were exposed to have not only exploited their students, but also they turned out to be degree mills. The PAP Government still remains reluctant to address protection of Singaporean students’ tuition fees against errant private school operators in Singapore . On helping older Singaporeans to lead full and active lives, the PAP Government has indicated its intention to raise the retirement age to close the gap between life expectancy and retirement age. However, this age discrepancy also affects other policies such as CPF and the Maintenance of Parents Act. Lately, more and more elderly care centres can be found at HDB void decks to assist young adults in taking care of their parents. The fundamental problem that the CPF scheme is over-stretched to provide for healthcare, retirement and housing is still not addressed. On providing affordable healthcare, the PAP Government has introduced means-testing as a barrier to healthcare subsidy for Singaporeans. The means-testing benchmark differs substantially between general hospitals and community hospitals, so many Singaporeans who qualify for healthcare subsidy in the general hospitals will find themselves ineligible for any subsidy upon transferring to community hospitals. The public remains skeptical that liberalising the healthcare sector in Singapore will eventually stabilise and reduce healthcare cost and whether the cost reduction will actually be shared with patients. PAP’s result on delivering its 2006 Manifesto is a mixed one. Yet in this coming General Election, there are 2 unique factors that will set it apart from General Election 2006 – LKY’s eventual demise and the global economic crisis. Bread and butter issues will definitely remain as the primary agenda driver for coming General Election. Job security, affordability for healthcare and housing are most likely the most important factors for next General Election.